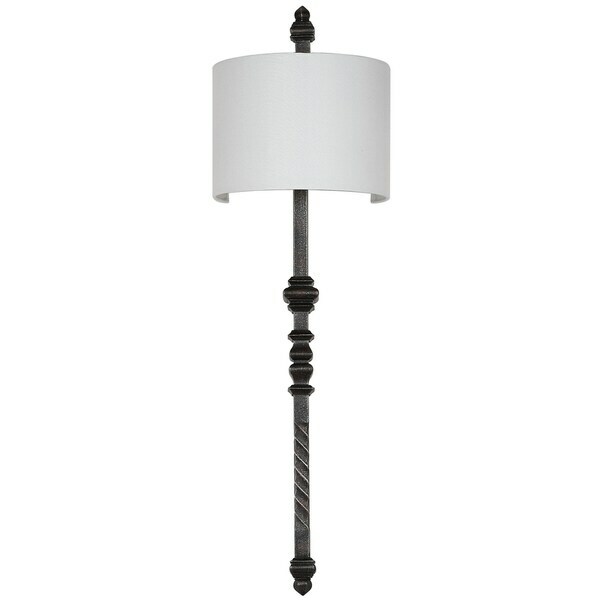 Safavieh Lighting 40-inch Covington Silver Black Wall Sconce - 12" x 9" x 40"
Imbued with the style of a grand maison, this 40-inch wall sconce lends character to the living room, foyer or bedroom. Paired with a classic off-white shade, its silver black finish recalls the patina of a fine antique. Use in pairs for a designer touch. Dimensions 12" x 9" x 40"
Beautiful and sturdy. The silver flecks on black actually create a softer tone than the all black iron versions of this sconce I've seen on other sites. Beautiful - I sprayed gold and gilted - really lovely and great price. Note: the shades quite large so measure your space. The size and length of the item is fantastic! I had been looking a long time for a sconce with this length in this color. Would highly recommend anyone to purchase who likes clean lines and a sophisticated look. We used ours in the bathroom by the vanity. Lovely piece. Iron base is substantial and sturdy looking. Shade looks very nice. Easy to install. Would highly recommend. Great quality for the price. More silver than black but still looks great! Beautifull wall scone. We purchased two of them. They give a great light in the room. Very happy with purchase and fast shipping. We love these sconces. 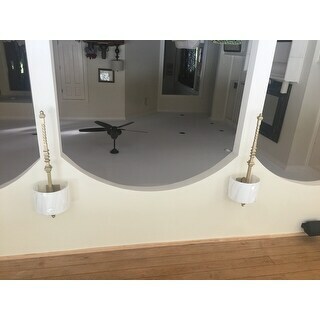 Perfect for our 12' ceilings. The metal is nice and heavy. The silver flecks are very subtle and give a gentle softness to the overall effect.It was very well packaged and shipped quickly. We are very pleased. Saw the same in a catalog and Overstock price was much lower! "How bright is this light? What bulbs does it use? Could it be used on the sides of a mirror in a bathroom?" This lamp comes with a CFL bulb and the maximum wattage is 13W. "Can you turn this on and off on the fixture itself, or does it have to be done via a wall switch?"